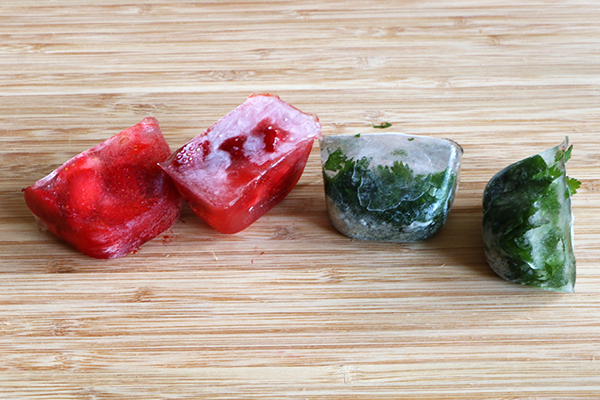 If you can’t use that entire bag of basil before it starts to wilt or if you want to make your money spent on infused water ingredients last even longer, consider making infused water ice cubes! Let’s get started. Fill an ice cube tray half way with water (it does not have to be exact). 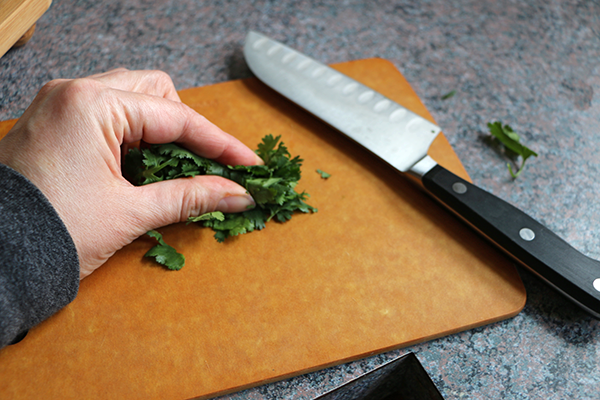 For herbs, you are going to want to rinse them and ball them between your fingers into a roll (or chiffonade) so that they are cut up into small pieces. 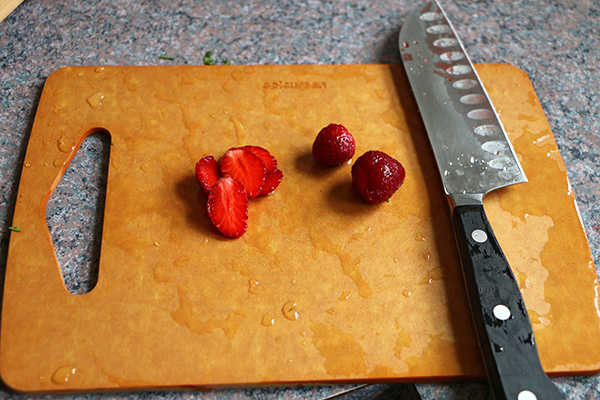 Having more surface area will help the pieces to release more flavor once they are infused. For fruits, you will want to slice them thinly for the same reason as the herbs (more surface area will result in more flavor). 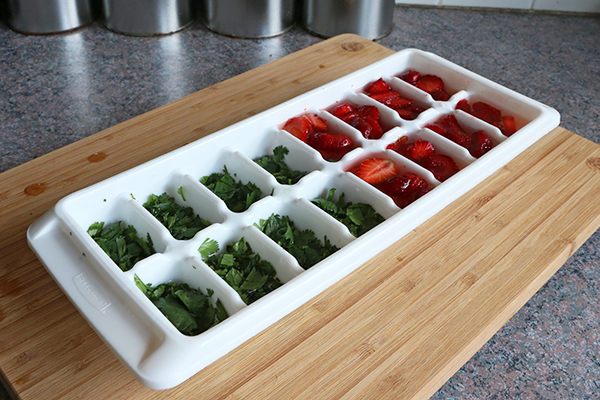 These strawberries are very ripe and started infusing in the ice cube tray as soon as I put them in there! You can mix and match ingredients in the same ice cube tray. Submerge the herbs in the water and press them down with your finger. The herbs do not need to be completely covered, but do the best that you can. 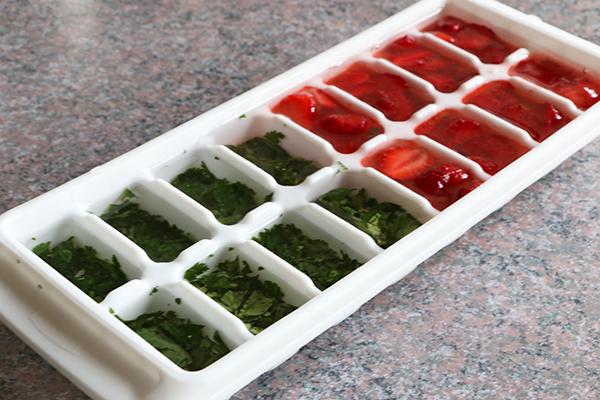 The strawberries will likely fill up most of the remaining space in the ice cube compartments, and that’s okay. Next, put the tray in the freezer for a few hours. 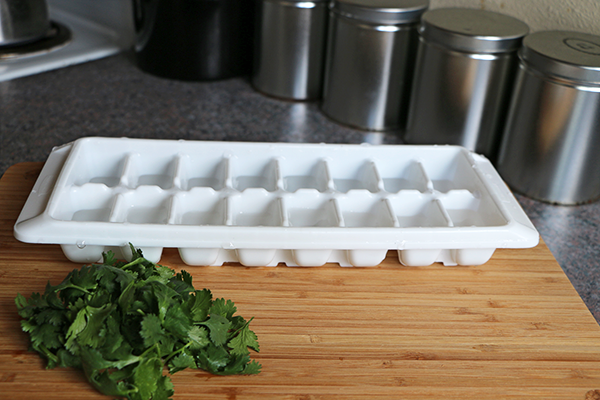 The biggest hurdle in making herb-infused ice cubes is that all of the herbs float to the top, but that is why we only filled the tray half way: you are going to add some more water to the top of the cubes. After the ice cubes have frozen for a few hours, add a little more water to the top. You can add more water to the strawberry cubes (or any fruit), but it is not really necessary if they are already near the top of the tray. Now, you can let these infused ice cubes remain in the freezer for weeks and probably even months. Just pop one out if you want to use it as an ingredient in an infused water or if you are running out the door for work and don’t have time to make an infused water. That’s it! P.S. 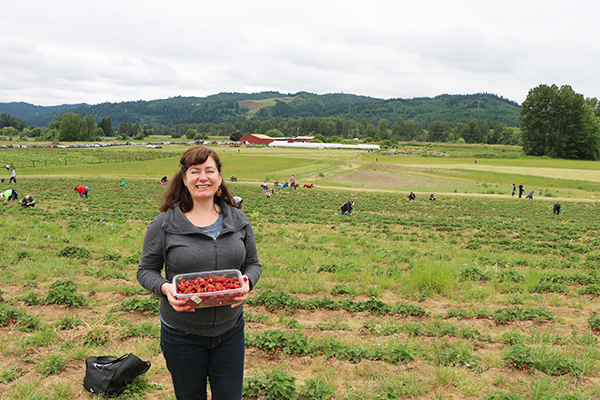 Here is a geeky picture of me squinting in the sun while strawberry picking this weekend in Oregon. Love.Love.Love! the infused iced cubes especially to make fresh infused waters when rushing out the door! Hi Amy, for how long can we store the ice cubes inside the freezer? 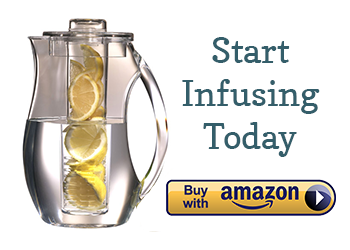 I’m just new in drinking infused water. Thank you Amy for sharing this. 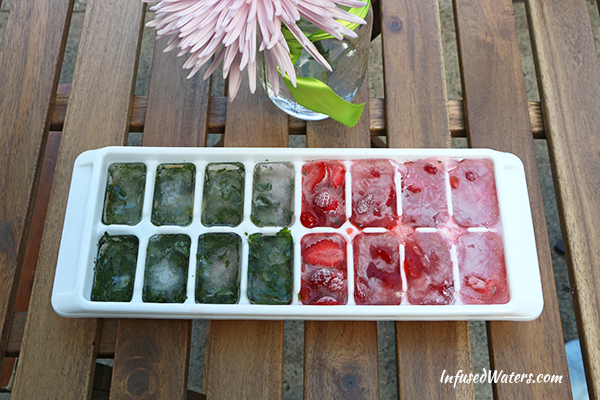 Thanks for you helpful tips for making Infused water Ice cubes. i tried it and i got the very delighted Infused cubes really good. Hello…. once the cubes are frozen…. did you just drop the infused cubes into plain water? You can drop them in plain water and enjoy. It takes a bit for the cubes to melt as the flavor mixes with the water. Once the cubes are frozen…. do I just drop it into plain water? I am a designer out in Bangkok and just learned about the infusion water method. I will try a few variations and get back to you. I can’t imagine the out come but but I am willing to try. Infused water is good for any time of day! Many of these recipes are a great way to start your day, and some are alternatives to coffee as well. Hi, I have Oral Allergy Syndrome (Can’t have fresh fruits or veggies). I found a way to have smoothies by boiling the fruit then freezing them in ice trays. Would the cubes that I make work for infusing water? These will probably work fine, especially if you let the cubes defrost, infuse, and then strain the infused water because boiled fruit might get soft and break apart. I want to make ice cubes for an infused water that has cucumbers, granny smith apples and mint. I am making this for a party. What kind of mint should I use? Can I do the cucumbers and apples in the ice cubes? Thank you for the great advice! I’d have never thought to add the herbs to water, but I guess it can be good if they’re fresh. P.S. SPF sunglasses and a hat! You’ve got to protect yourself.